The Gadget: Datel Wildfire, the first third-party PlayStation 3 controller to support a combination of Bluetooth, rumble and tilt sensitivity. 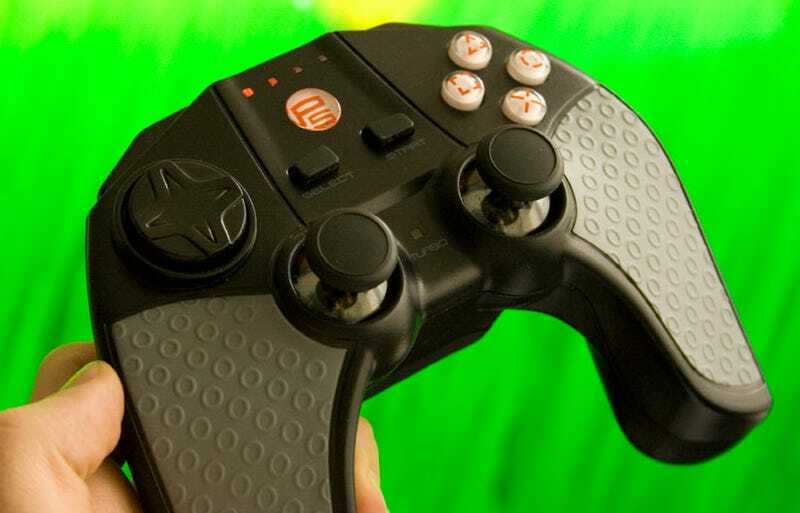 The Verdict: Even at $10 less than Sony's Dual Shock 3, the Datel Wildfire is a pass. The controller actually feels decent in your hand, with an interesting pistol-like contour and a useful rubber texture. And its build quality is decent—it doesn't feel cheaper than a Dual Shock or SIXAXIS. But the rumble isn't fantastic, the buttons are all a bit stiff and the altered, trigger-like position of L2/R2 buttons makes it a leap for your fingers to reach L1/L2 (similar to the Xbox 360, but exaggerated for the worse). I didn't notice any inherent lag or inaccuracies in either the analog sticks or the tilt sensitivity, but I found it hard to pull off any maneuver with laser speed. And additional turbo functions can do little to combat buttons that are hard to press quickly. Plus, even though it plugs in via mini USB like official PS3 controllers, the Wildfire runs on AA batteries. Sony's integrated rechargeable lithium ion alone probably makes the $10 premium worth it.